Veterans Day is a wonderful tribute to the brave men and women of the U.S. Armed Forces, but a single holiday hardly pays sufficient tribute to military veterans for their service and sacrifice. That’s why the Ziff Law Firm in Elmira created the Veteran of the Game program. We honored more than 200 veterans and active-duty personnel in eight seasons of Elmira Jackals professional hockey games at First Arena in Elmira, and when the team disbanded at the end of the 2016-2017 season, we successfully moved the program to the Broome County Arena, where more veterans were honored last season during the home games of the Binghamton Devils pro hockey team last season. Elmira’s First Arena, during homes games of the new Elmira Enforcers. 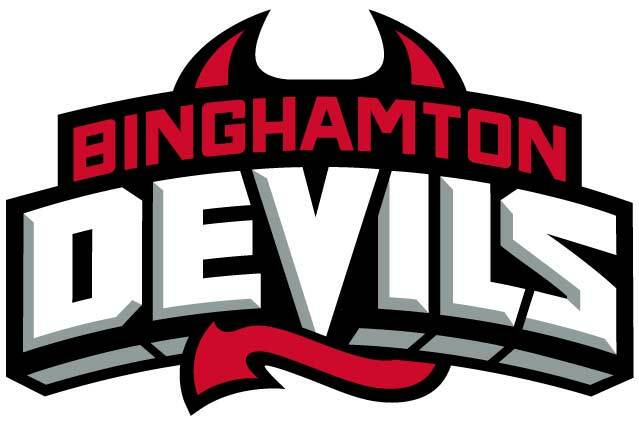 Binghamton’s Broome County Arena, during home games of the Binghamton Devils. Twin Tiers residents can nominate veterans and active-duty personnel home on leave to be honored during home games at either arena. The honored veterans receive four free tickets for an Enforcers game or a Devils game. The Devils dropped the puck first, starting their season on Oct. 6. The Enforcers, a new team announced in July, open their season Oct. 26 against the Danville Dashers at the David S. Palmer Arena in Danville, Ill. The Enforcers’ first home game is Nov. 16 against the Carolina Thunderbirds. Game time is 7:05 p.m. at First Arena. During the game, the public-address announcer will introduce the honored veteran or active-duty service member and read a short biography of their military service. Once the reading of the biography is completed, the announcer will encourage a round of applause for the honored military member, who can stand or remain seated as hockey fans let out a big cheer. Call: 800-943-3529 or 607-733-8866 during business hours weekdays. For questions or more information, contact program coordinator Annette Viselli Thorne at (607) 733-8866 weekdays or [email protected].